Story: Four paramedic units have to share the same frequency for broadcasts to Rampart. 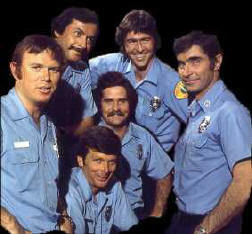 Johnny and Roy respond to a call where a policeman has been hit by a car. A man is trapped in his sculpture. A man and his son are injured at a construction site. 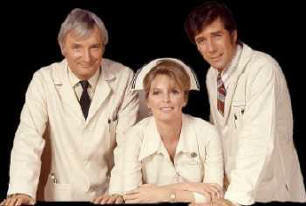 A biker-gang rumble overloads the hospital staff at Rampart and Roy and Johnny help out. Johnny must deal with the death of a friend. Goofs: (1) In the last rescue Johnny moves the old man out of the way of the falling walls and he throws is helmet on the floor, seconds later after talking to Brackett on the biophone the helmet is back on his head, then he takes it off again. 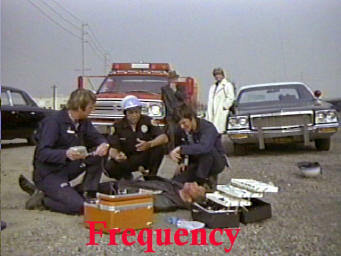 (2) In the episode called Frequency at the construction accident at the end. One of the squads calling Rampart during the rescue is Squad 18. However a couple minutes later you hear Squad 18 get called out to another rescue all together.